mean ol' meany: Ohhhhh, So You Like BOYS? Ohhhhh, So You Like BOYS? As most of you know, John Amaechi, a little known journeyman basketball player, has written a confessional about his life as a homosexual. And also, as you know, Tim Hardaway HATES homosexuals. Just so you know, Tim Hardaway is a retired "balla." Here's my take on this "sticky" situation. Amaechi has obviously been ashamed of his lifestyle to wait so damn long to come out. Therefore, I offer names for his new book. 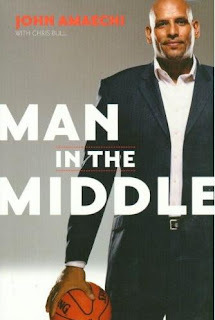 I know that it already has a title, "Man in the Middle." Don't laugh, it ain't funny. And check out the "Those that purchased this book also liked" line. That IS funny. They just write themselves. And before you get all bent out of shape, every damn one of my friends is gay. Offer your own titles in the comments. UPDATE: For further clarification, John Amaechi's player ranking was a whopping 9.13. By way of comparison, Erick Dampier, another journeyman center from my alma mater no less, has a stellar 18.27. That means that he is twice as good as Amaechi. And to throw another player in the mix that you may have heard of, Diesel has a miniscule 45.69 player rating. Hell, Alonzo Mourning is the proud owner of a 32.21 player ranking and he has had a kidney transplant. So now you know that the only thing that John Amaechi has done to make his mark in this world is write a book about how much he likes the dudes. Just saying.